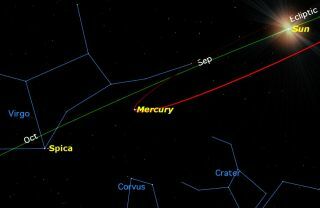 On Friday, Sept. 4, Mercury will be at its greatest elongation east of the sun. Mercury is a very challenging planet to view, but this week, skywatchers have a good chance to see it, especially in the Southern Hemisphere —on Friday, Sept. 4, the planet travels as far east of the sun as it can go, its greatest elongation. Here, we see the planet as we might from space —for example, on the International Space Station or with the Hubble Space Telescope. The green line marks the ecliptic, the path the sun appears to follow over the year from Earth's perspective. Most of the planets also appear to revolve in this same plane. How will Mercury look to viewers on Earth? It very much depends on where you are located. As seen from Europe and North America, the ecliptic makes a shallow angle with the horizon, so Mercury is not well placed. This view of Mercury is how it will appear to me from my location close to Toronto at sunset. Everyone at a similar latitude across southern Canada, the northern United States and most of Europe and Asia will see something very similar. Because of the Earth's current position in its orbit around the sun, the ecliptic makes a very shallow angle with the western horizon as seen from the Northern Hemisphere. So, even though Mercury is as far east of the sun as it can get, at this time of the year, it ends up very close to the horizon during the best viewing time, around sunset. To make matters worse, because of its orbit's tilt, Mercury is quite far south of the ecliptic at this time. As a result, Mercury is barely 7 degrees above the horizon at sunset. As seen from Australia and South Africa, the ecliptic makes a steep angle with the horizon, so Mercury is very well placed. The situation in the Southern Hemisphere is very different. This view shows the sky from Australia. The ecliptic makes a very steep angle with the horizon —and Mercury is south of the ecliptic, so the planet is much higher above the horizon at sunset (26 degrees, in fact). This situation reverses in the spring, when Northern Hemisphere skywatchers get a fine view of Mercury at dusk and Southern Hemisphere viewers are out of luck. It also reverses when Mercury is at elongation on the western side of the sun —as far away from the sun as possible in that direction. That is why, every year, we publish a table showing which elongations of Mercury will be favorable or unfavorable, depending on which hemisphere you view it from. Mercury viewed through a telescope is a disappointment. The most you will see is a tiny disk, which goes through phases similar to Venus' and the moon's. But it is a great satisfaction to most stargazers to say that they have actually seen it at all.